In 1969 towards the end of her marriage to the French film director, Roger Vadim, Jana Fonda went with her father, Henry, to a screening of a new film her brother had just produced and co-written. I’m with Fonda today in Montreuil because I’m reading her life story: Paris, Vadim, the Sixties, marriage, fame, radicalism: these are all areas I’ll consider in the coming weeks; Fonda and Vadim too. Fonda is 70 this year: that makes people like me think. But now as I sit watching bikers at breakfast in Montreuil, chilling out over corn-flakes to the ambient Indian music that plays in a breakfast bar with light design out of a 1990s nightclub’s chill-out zone; and as I sat last night watching German bikers fidgeting over beer at dusk (literally: “ach so, Montreuil” the rest was silence); and considering the memories and memories to come of the many bikers at Jeannette’s hotel, I’m wondering how influential was that film? One of the key ideas of this trip is to explore the technologies and artistic creations that changed the way we see the world. I’m going to see the places where printing, the web, surrealism, photo-journalism, the documentary, mirrors, even modern accounting got going. In Amiens – in a few days time – I can confront Jules Verne (and John Ruskin). Here in Montreuil there is Victor Hugo to come, but he must wait until I can write clearly. 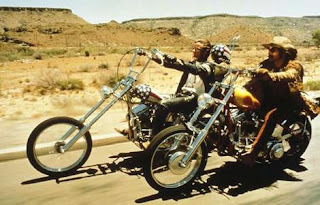 Instead I think about Easy Rider. A picaresque creation, like Coryat’s, or Sterne’s sentimental journey. Like Don Quixote, published three years before Tom’s trip; like Candide. Only with cocaine in the side pouch, and Steppenwolf on the soundtrack. Did Easy Rider inspire all these roads to freedom that buzz past me? Now so many people can be high-speed road movies, after all, though I am not sure what is gained in passing through countries at 120 miles an hour other than the act of passing time itself. There are the sweaty pit-stops; the aching evenings, surely; the sense of having passed through but not committed. I will have to ask. It can only be a matter of time. And the one that got away in fifth. This entry was posted in Montreuil-sur-mer. Bookmark the permalink. These pages reflect a few of the places I've been since 2007, when I first read Thomas Coryate's Crudities of 1611. One day they'll be in order.